Is the road calling? Are you bored of staying in not-so-good, overpriced hotels and traveling by air? If yes, an RV would be your perfect companion in exploring the country at your own pace. Buying an RV that meets your budget, personal requirements and preferred traveling style is, however, not an easy decision as RVs come in different shapes and sizes. This comprehensive guide will help in making the right pick before you take the plunge. The big RV has every amenity that you could think of during the travel. There is a living room, kitchen with refrigerator, dishwasher, microwave, bedroom with closet space and bathroom with shower and flushing toilet. Also known as Camper Van, a Class B motorhome is smaller and has better maneuverability than Class A motorhome. It has a kitchen, television, and bathroom. This type is ideal for 2 to 3 travelers. A popular type of RV, Class C is easy-to-drive and has ample sleep area for the family. Class C motorhome has slide-outs and a few more features which make it perfect for long weekend getaways or even long vacations. The lightweight yet sturdy travel trailer is easy to tow by SUVs, minivans and standard pickup trucks. The modern travel trailer has bunk beds, satellite TV and built-in generators. A fifth-wheel trailer has a large hitch pin to attach to a mount on the bed of a heavy-duty pickup truck. The trailer is stable and easy to back up into a campsite. It is excellent to travel on local mountains. The pop-up or folding trailer is the lightest of all the models and the most affordable one. It can be towed with a minivan. The travel comes with toilet, shower, and kitchen. It is ideal for weekend trips. A truck camper is ideal to travel to rough terrains and steep grades where you can’t take trailer or motorhome. The perfect offroading companion comes with a toilet, shower, and even a small kitchen. The bigger the RV, the more maintenance it demands. You must have the right vehicle to tow the RV or another vehicle behind it. If you are planning to spend a lot of time on the road, look for an RV with decent gas mileage. Most of them have a fuel economy between 8 to 20 mpg. Bigger the RV, the higher insurance premiums will be. 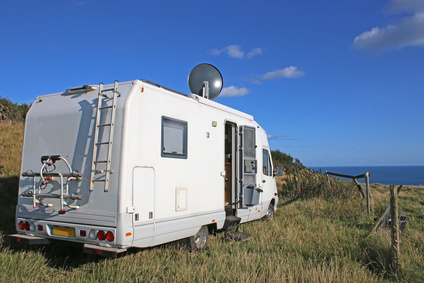 For those who want to stay connected, it is necessary to buy an RV with Wi-Fi booster, satellite TV, mobile Internet or GPS. While both the categories have their pros and cons, a used RV is a better deal for those who are just starting out. You will save a significant amount of money, which could be used in fitting new amenities in the RV and customizing it as per your preferences.